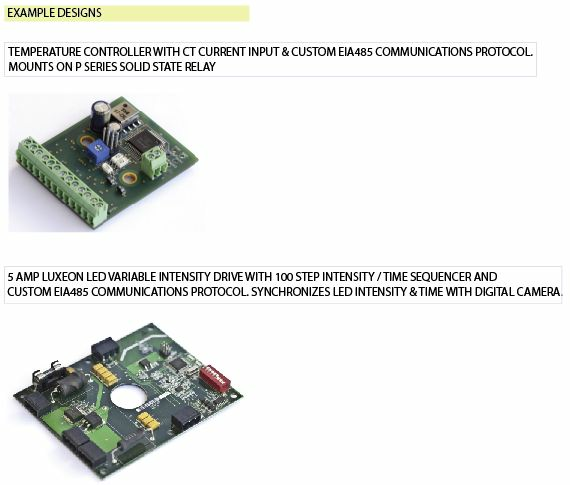 Design Services | VB-Controls provides custom electronic designs. VB Controls was orginally and remains a product development company. Our Product Design Service provides turn-key development of client defined and owned products. Our scope includes electronic circuit design in FR4, metal clad PCB or metalized ceramic, embedded software development, metal preform design, purchasing, prototyping, validation testing to acceptance criteria, agency approval facilitation, test equipment development, initial production and client training. A product design project is NRE based and does not rely or any production profit. The client completely owns the product, royalty free and we will help gear up the client's manufacturing or their manufacturer of choice. For high speed product design, from Concept to Production, choose VB Controls. Purchasing, prototype build and evaluation. Manufacturing start-up, including training and equipment sales if desired.